One of the most versatile pieces in any professional wardrobe, this item can also add polish to jeans and a tee for an evening out. The best versions have multiple colors woven into the fabric so you can match them with just about anything. 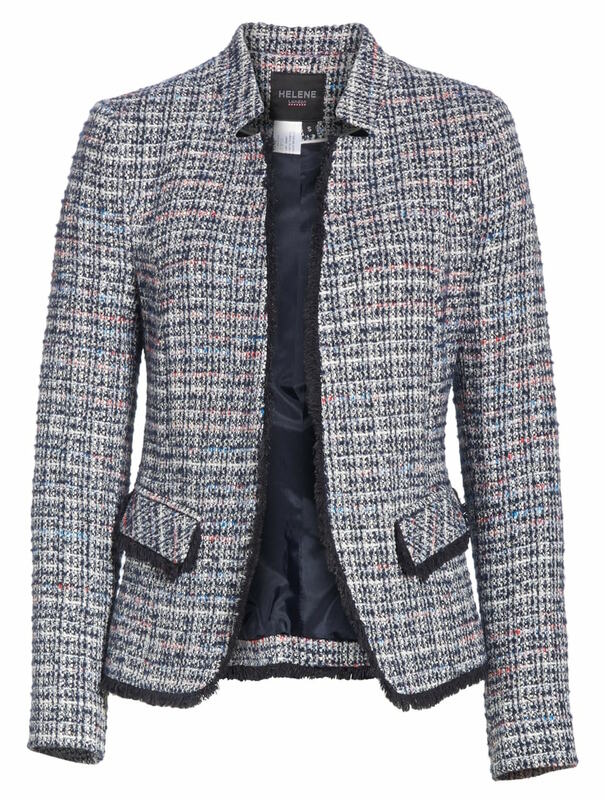 Swap out your suit blazer for a fresh look- tweed’s texture makes it easy to pair with just about any suiting fabric. Go for a style with modern updates like no-lapels or zippered pockets too keep from looking like you’re on your way to tea-time. Click through our picks above to shop! Quality counts and yes, sometimes this does mean paying more. Pricier shoes often mean better materials, greater durability, more cushioned insoles, solid construction (instead of veneers), and leather soles and linings. You can usually find a shoe like this in the $200-range (retail), so you don’t always have to spring for designer to get a quality shoe. Opt for a shoe with as much leather construction vs. synthetic as possible (barring ethical objections). Leather is essentially skin- it breathes, stretches, and softens with use, while plastic doesn't. Leather linings won’t give you as many blisters as synthetic ones. Man-made soles can be stiff, while leather ones are more flexible. Leather uppers (read: the outside of the shoe you see) can usually be repaired if scratched or scuffed*, while synthetics usually can’t (or don’t warrant the cost to fix). *Save patent leather for special occasions; once these shoes get a scuff, it’s nearly impossible to remove it. Nubuck is also a tricky finish- it’s similar to suede but shows wear much more quickly. Thicker, stacked heels offer greater stability, which usually translates to comfort; the weight of your heel is distributed over a greater area, and greater stability means less wiggling around in your shoe (which is potential for friction and blisters). A bit of a platform can also make a shoe more comfortable, since it will absorb some of the impact at the ball of your foot, and makes heels feel lower without sacrificing height. 4. This little piggy needs room. If you can't resist a heel higher than 2”, a gel insert under the ball of your foot can make a world of difference. If you’re between sizes, go for the ½ size larger to accommodate the width of the insert (usually 1/8” thick). The concept of ‘business casual’ would seem, in theory, to make the chore of getting dressed easier and simpler for the professional woman. But vague rules, changing social norms, and dynamic industries make this a confounding and frustrating dress code to follow. Every workplace, industry, and individual is different, so setting hard-and-fast rules is difficult, but we’ve laid out some guidelines for determining what is appropriate, and shared tips for looking both easy and professional. Evaluate your workplace. Do you work in a progressive industry like tech, or a conservative one, like financial services? What is the demographic makeup of your office? Do you have mature colleagues with more traditional attitudes who may be offended by certain styles? Your locale is also a factor- cities like Los Angeles and Miami are more casual than New York or Boston. Set personal parameters. Determine if jeans are appropriate, and if so, decide in what capacity- should a blazer always be worn as well? Decide if you would feel comfortable baring your shoulders or knees (or both simultaneously). Fitted silhouettes also deserve consideration. Amp up the ‘extras.’ A less formal dress code is a great opportunity to inject a little personality to your look with a statement necklace, scarf, or printed cardigan. Adding some extras also pulls together a casual look and keeps it from looking generic, like a secret service agent or restaurant server. Your ultimate goal should be a balanced look that reflects the (in)formality of your workplace. Evaluate a look as a whole and decide if it is both relaxed and professional enough for your office. 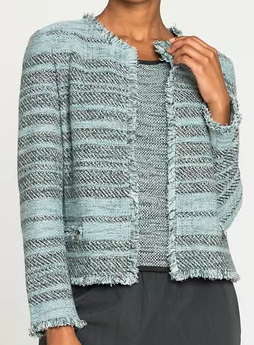 Traditionally formal or dressy elements like suiting blazers or pencil skirts should be paired with less polished pieces like jeans or unstructured sweaters. Check out the looks we’ve styled incorporating some of these guidelines. They reflect the wide range of business casual from ‘Polished Casual’ to ‘Easy Professional.’ Click on the photos to shop the looks! So many of our clients struggle with dressing 'business casual' because it's one of those 'messy middle' conundrums. The best place to come get support from us is in our complimentary Facebook group. Click here to join! Ask questions and share your thoughts below- what's your strategy for pulling together a business casual ensemble? If you look around at what’s going on in a clothing store most people are looking at price tags, not clothing. What this means is that most women are not getting what they want but rather getting what they think they can afford. It can also equate to filling your closet with mediocre pieces that give you the illusion of having more clothing options but that never give you the ease of having great outfits that you love. I conducted a research study early in my career and the most interesting finding was that consumers of fast fashion (versus slow fashion) invested the same amount of money in their clothing. If you’re familiar with this terminology you’ll know that typically fast fashion includes stores such as Forever 21, Zara, and H&M. Their clothing is often a lower price point, lower quality, and has the reputation for being disposable. Slow Fashion on the other hand tends to more expensive, possibly designer labeled, and more seasonless. My hypothesis for this research was that slow fashion consumers would have spent a considerable amount more on clothing simply due the price point and quality of slow fashion clothing. As I mentioned, this was NOT the case. Do you know what this finding really shows us? Women do not need to break the bank OR shop cheap, trendy stores to build a wardrobe they love! This finding serves as a guiding principle at my personal styling company, Watson Style Group. This principle allows us to build high-quality wardrobes that gives clients a closet full of good-to-go outfits and you can have the SAME thing with a just a few tweaks to your current shopping habits. The reason why shopping sales is destroying your wardrobe is actually quite simple. It facilitates adding more unintentional, “this could work!” clothing into your closet. Unintentional sale purchases cause frustration for every woman we work with. Not only do they make getting dressed more of a challenge because you don’t really love these items, but they ultimately cost more money because you have to “make” them work. We see this every single day- when you’re tired of them taking up space in your closet they make their way to the donation pile. I want to be clear that I’m a huge advocate for buying things on sale. I’m also a huge advocate for buying fewer items and paying full price for items that will serve as staples in your closet. This fear also keeps women frozen, unhappy with their wardrobe, and buying items that are ‘safe’ (inexpensive and versatile). Here’s how to put the kibosh on this “fear of buying the wrong items” so you can finally start to build your dream wardrobe. You deserve it!! No matter where your price sensitivity falls we all swoon over a bargain- ask yourself “would I pay full price for this?” before purchasing- 9 times out of 10 answering this question honestly will keep items out of your closet that take up space and will allow you to fill your closet with items that you love and know exactly how to wear. Always, always, always choose quality over quantity. You may feel as if you need more clothing but actually you need more outfits. The quickest way to more outfits are high quality pieces that expand the options you already have. Adding a quality, versatile skirt and blazer to pair with some of the workhorses you already own can add miles to your closet. Shop in outfits. This is an extra special tip because it’s crazy impactful whether you adore shopping or hate it. When you go shopping, whether it’s for fun or because you’re in desperate need of something, make sure you have a list! This list should contain items that create an entire outfit- either using pieces you have at home or pieces you’ve envisioned to create the full outfit you’re searching for. 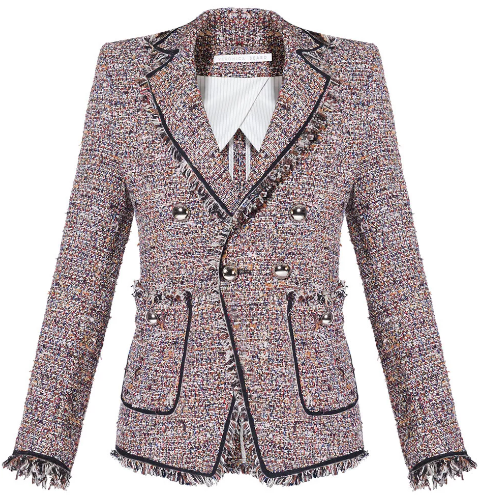 This list can be as simple as a note in your smartphone- find great white tweed blazer for travel to pair with Burberry scarf and red silk blouse. We give step-by-step instructions for creating a return-proof shopping list in our complimentary Online Shopping Guide for Polished and Professional Women. Some women fear these suggestions will diminish the joy or the easy breezy nature of their shopping trips. These tips will help you create outfits which will not only bring incredible ease to your life but make shopping even more enjoyable. The beauty of outfits (versus random clothing purchases) is that it they make you feel like you’ve invested significantly more in to your wardrobe than you really have. $5000 worth of clothing feels WAY different that $5000 worth of outfits. We’ve all been there, so give yourself a break! What you want is $5000 worth of outfits, not clothing. $5000 worth of clothing can easily (I’m talking EASILY) make 30 perfectly styled outfits. Using an average item cost of $100 (some will be less, some will be more) and estimating that each of your outfits use about 5 pieces, your styled outfits have a value of $500 each. Multiply this outfit value by 30 and voila! your wardrobe now FEELS like you spent $15,000. In each scenario you spent $5000. In scenario one you gained quite a bit of clothing but were left saying “I have nothing to wear” after a couple months. In scenario two you gained 30 outfits and wardrobe that feels like you spent $15,000 when you really only spend $5000. And let me tell you from personal reality and 10 years of personal styling experience, a wardrobe that feels like $15,000 transforms lives. Women are fueled by how the feel in their clothing and when a woman has a closet full of good-to-go outfits very little can stand in her way. It’s always well over the figure they had in their mind. If you’re spending quite a bit on clothing and you don’t have something to wear to every single place you need to be- that’s a problem! You must take this advice and triple your investment by turning everything you own into outfits you love. Download our complimentary Online Shopping Guide for Polished and Professional Women. It will teach you exactly how to add outfits (not just clothing) to your wardrobe and it teaches a simple and super fun way to to make a return-proof shopping list! 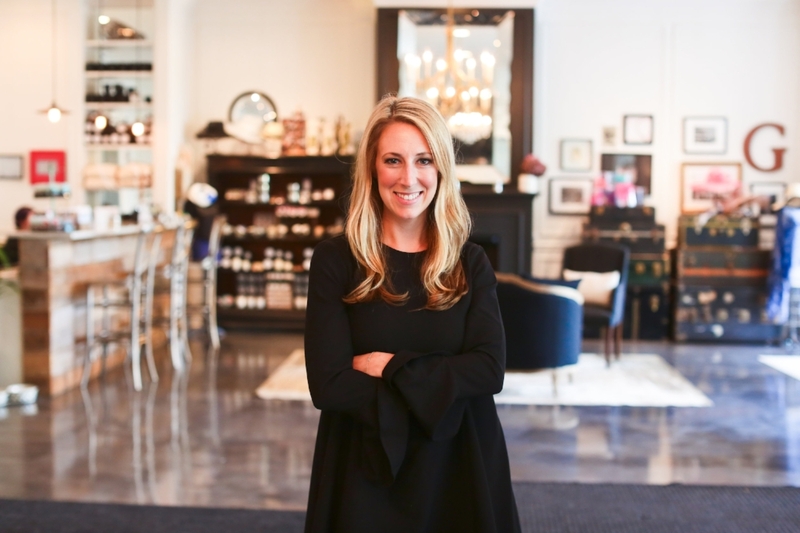 This ultimate shopping guide also categorizes over 100 stores and brands so you’ll know exactly where we go to find the perfect items for our polished and professional clients. Enjoy! Zarley Watson, Maegan, and Ruoh‐Nan Yan. "An Exploratory Study of the Decision Processes of Fast versus Slow Fashion Consumers." Journal of Fashion Marketing and Management: An International Journal 17, no. 2, 141-59. doi:https://doi.org/10.1108/JFMM-02-2011-0045.